(CNN) -- U.S. senators from New York have announced legislation that would grant posthumous honorary citizenship to victims of last week's shooting rampage in Binghamton, New York. 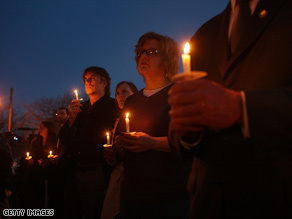 People take part in a candlelight vigil this week for victims of the Binghamton, New York, shooting rampage. "The people who were so cruelly and suddenly taken from us in Binghamton were the very epitome of the huddled masses yearning to breathe free who have made America a great nation," Sen. Charles Schumer said in a statement, referring to the famous line in the Emma Lazarus poem "The New Colossus" that's affixed inside the Statue of Liberty's pedestal. The legislation, announced by Schumer and Sen. Kristen Gillibrand, could give posthumous citizenship to as many as 11 of the victims of Friday's shooting. According to police, Jiverly Wong, a 41-year-old, walked into the American Civic Association and shot 17 people -- 13 of whom died -- before turning the gun on himself. The association helps immigrants and refugees from around the world, and Wong had taken English classes there. Although two of the dead, Maria Zobiw and Roberta Bobby King, were from the United States, the other 11 were from Pakistan, the Philippines, China, Haiti, Vietnam, Brazil and Iraq, according to Binghamton authorities. It was not immediately clear if any had become naturalized citizens. Schumer and Gillibrand said their legislation would backdate the honorary citizenship, so victims would be considered citizens at the times of their deaths. "Fulfilling the dream of American citizenship is the least we can do for these mothers, fathers, brothers, sisters, sons and daughters who were killed while working so hard to become Americans," Schumer said. The first funerals for the victims were held Sunday afternoon at a local mosque in Binghamton. An interfaith memorial service for all victims was held Sunday evening, and hundreds of people took part in a candlelight vigil afterward.